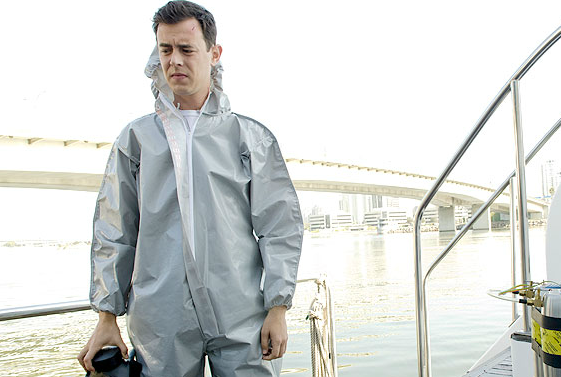 Dexter Daily: POLL: What Did You Think of Colin Hanks' Role As Travis? POLL: What Did You Think of Colin Hanks' Role As Travis? What did you think of Colin Hanks' role as Travis Marshall in the sixth season of the show? Hanks' role was first announced on May 9, 2011 as "a highly intelligent young expert on ancient artifacts who gets linked to a series of grisly murders in Miami". Was he as good as you expected? Vote below! What did you think of Colin Hanks' role as Travis in Season 6? I liked him more toward the end episodes, after the big reveal. Travis was a dish best served up cold on Dexter's table. I'm pretty much indifferent towards Travis. He was okay, but I just didn't care about him. And you can't say that that was the point, because he was an antagonist. I cared about all the past villains at least a little bit. He was just good not great. I think he looked the part of someone who wouldn't be suspected. I really liked Christina Cox as the bad cop and no one can top John Lithgow...he was the creepiest of the creeps. I can't wait to see what his son does this fall! I didn't like Travis at all, i found him just boring and not interesting at all, could be the script. He is supposed to be the main villain and the most interesting character but instead to me it was a pain to watch him, i found myself wondering more about the other characters and never gave a crap about him. Towards the end he got a little more interesting but that doesn't make up for an entire season. Maybe it's just me and this season just didn't appeal to me. I loved him from the beginning to the end, great acting from Colin Hanks. He played the good Travis and also the physco one so convincingly.